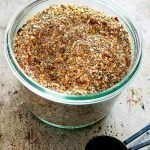 This all-purpose steak seasoning blend is great for steaks, chicken, fish, pork, and even vegetables. Make it now with the spices you already have in your pantry! Mix all ingredients together and store in a container until ready to add to your favorite recipe!